Garmin has announced the selection of its tandem integrated flight deck by Tactical Air Support, Inc. (TacAir) for its fleet of supersonic F-5 fighter aircraft. This configuration, which consists of a G3000 flight display and dual Garmin touchscreen controllers (GTCs), boasts an open architecture design that seamlessly integrates with typical mission equipment and hardware so pilots experience a single integrated cockpit system. Utilizing this rapidly deployable solution, the first flight of the Garmin-equipped F-5 is expected later this year. The F-5 is a supersonic, multi-role tactical fighter and attack aircraft that provides simulated air-to-air combat training, close-air support training, tactics development and evaluation support. Utilized by TacAir in an aggressor training role, the upgraded F-5 will economically evolve these aircraft into an advanced tactical fleet with sensor and system capabilities similar to current fighter aircraft. The modular G3000 integrated flight deck boasts a large and vibrant, high-resolution flight display that seamlessly interfaces to the F-5’s existing mission computer, enabling advanced mapping, tactical radio capabilities, radar display and more. The bezel keys, GTCs and L3 ForceX mission system serve as the pilot interface to the flight display, and the touchscreen controllers incorporate infrared technology so pilots can use gloves in the cockpit. The G3000 has an open architecture that enables seamless mission computer, sensors and systems integration and easily facilitates future upgrades without impacting the avionics. The NVG-compatible G3000 contains modern, state-of-the-art synthetic vision technology (SVT) that blends an “out-the-window” view of surroundings on the primary flight display, which is particularly helpful during nighttime operations or in terrain-prone environments. The G3000 also has worldwide communication, navigation, surveillance and air traffic management (CNS/ATM) capabilities. Additional features within the G3000 integrated flight deck on the F-5 include, Terrain Awareness and Warning System (TAWS), global ADS-B traffic and weather, as well as a video input. Commercial-off-the-shelf (COTS) Garmin hardware and software allows TacAir to take advantage of technological advances, cost savings and rapid procurement. These COTS solutions offer significant opportunities in reduced development time, faster integration of new technology and lower life-cycle costs. The G3000, along with many other Garmin solutions, also interface with a wide range of third-party products using industry standard protocols, reducing cost and streamlining installation complexity. Through its extensive dealer network and award-winning avionics product support, Garmin is renowned for its unrivaled global service network, offering complete life-cycle support. Field service engineers are strategically located throughout the globe to support any mission. 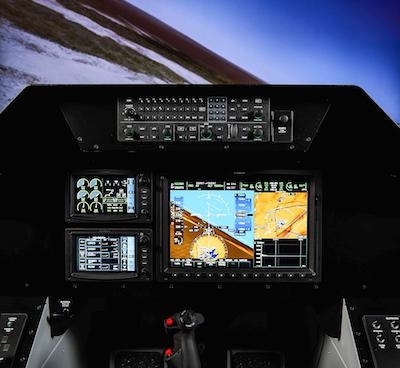 Garmin has a full range of training capabilities, including computer-based training, instructor-led training and full-motion simulator compatibility.